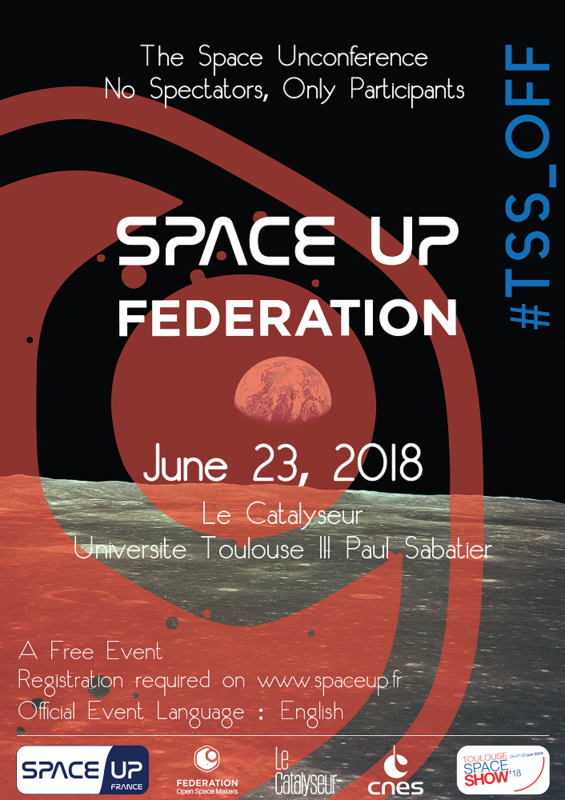 SpaceUp France and Open Space Makers are happy to announce a new SpaceUp Unconference hold in Toulouse on June 23rd, 2018, focused on the Federation initiative. Federation is addressed to fablabs, makerspaces, hackerspaces and other open places where collaborative manufacturing tools are available, as well as to the citizens wishing to invest their energy in designing and building the future world, to meet societal challenges such as the protection of our planet, to allow mankind to live one day in space or simply to achieve their dreams. This unconference contribute to the Toulouse Space Show Off events with the purpose to celebrate the first year of the Federation initiative. If you’ve never participated to a SpaceUp before, you may want to know a bit more about this kind of event : a SpaceUp is called an unconference, because it’s the opposite of a conference. Everybody could become speaker and public. You make the event too! Practically speaking, the day will be organised around presentations made by the guests and by the participants, in different rooms : from 5 to 15 minutes long for participants presentations, Everything is quite free within the schedule.